Three years to the day, I signed a paper that lead to the irrevocable termination of my employment contract with my previous employer. This was both a scary and exciting moment. Scary because an attractive monthly paycheque would be a beautiful memory of the past. Exciting because I knew I was finally following my passion and on the way to making a dream come true. Three years later, I still love my work more than anything I ever did professionally, and I cannot imagine ever going back to an environment in which someone else would try to control what I do, how I do it, and when I do it. To achieve this, not everyone needs to quit their jobs. Many people are cut out for the corporate world, and not everybody needs to become an entrepreneur to experience a fulfilling life. Doing more of what you love and still getting paid for it may very well be possible within the organization or industry you currently work in. If you are looking for a more rewarding work so that you jump out of bed on Monday mornings, here’s a simple but effective three step exercise for you. 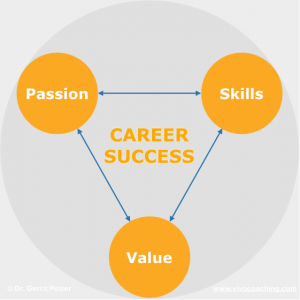 In order to find work which you enjoy, which adds meaning to your life, plus pays your bills (and hopefully more), you must find the overlap of the three corners of the Career Success Triangle. You must match Passion, Skills, and Value. You will only enjoy your work in the long run when you are intrinsically motivated, when you naturally love what you are doing. I never met anyone who was happy in a job which they were doing just for the money – even when it was lots of money. What are the things that make you lose track of time? What makes you stay up late at night, and wake up early the next morning because you can’t wait to continue? What have you achieved in the face of enormous challenges or despite massive resistance? You can ask your parents what they observed you completely involved in when you were a child. Professional assessments like the Myers-Briggs Type Indicator (MBTI®) may as well help you understand yourself better. In coaching sessions, I know we have tapped into my client’s true passion when I see this unique sparkling in their eyes. These are memorable and utmost rewarding moments. People tend to limit themselves by thinking what they are passionate about is funny, awkward, or weird. They are afraid of what other people might think. Or the fear of potential obstacles or of not being good enough stops them even before starting exploring any options. You can raise your concerns later, and doing a feasibility study for businesses is certainly wise. But now is not the time. Remember the most important rule of brainstorming: don’t judge! Just let the ideas flow for now. I remember a Thai woman who told me that she actually loves writing concepts for TV shows. In fact she had some drafts already in her drawer. But she hadn’t told anyone before because she thought people would laugh at her. A director I worked with got the sparkling in his eyes when he told me he was passionate about wine – and that was not just about drinking it. His passion had little to do with the work he had done over the last decades, but our discussion suddenly triggered some new business ideas. Next is to explore your unique skills. What are your strengths and capabilities? What are you naturally good at? For most people it is surprisingly difficult to tell what they are good at simply because it feels so natural to them. Friends or people you work with may admire you for something, but you don’t feel that it’s anything special. Just like a Managing Director of a large organization in Thailand who I interviewed recently. She herself felt that she was not particularly good at leadership skills. However, over the years she realized that others perceived her as a “natural born leader.” She recalled that early on people asked her to lead group activities outside work, and professionally she climbed the ladder of success quickly. She was genuinely surprised by what other people saw in her which she didn’t see herself initially. If you like you combine the exercise with the famous Johari Window. The free “VIA Survey of Character Strengths”, based on Martin Seligman’s renowned work on Positive Psychology, may help you find the missing piece to solve the puzzle. Reality Check – How Do Your Skills Match With Your Passion? To find your ideal job within or outside your current organization, you want to have all corners of the Success Triangle overlap as much as possible. Check now how your skills match with your passion. If you dream of becoming the president of your country because you are passionate about creating a better future for your people, then it’s a good start when others tell you that you are amazing at inspiring others, have outstanding political and economic knowledge, and that they are impressed how effectively and diplomatically you negotiate. If your passion is playing the piano but your private concerts make people flee the room, becoming a professional musician may not be your optimum career choice. Or maybe maths has always been easier for you than for most other people. However, if there’s no heart in solving complex equations, then maybe you won’t be happy as an engineer. You have just found your true passion and you possess the matching skills? Perfect. You are on the way to find your ideal job and towards a more rewarding and fulfilling life! How can what you are truly good at and what you are incredibly passionate about add value to other people’s lives? “Do what you love and the money will follow” is a dangerous nonsense. If it was that easy, we would live in a world crowded with happy and fulfilled people. The reality is we are not. If other people do not see value in what you are doing so well and passionately (i.e. they are not willing to pay you for what you do), you might be starving before becoming rich and famous. Finding what is valuable for others and ultimately getting the biggest overlap of the triangle is probably the hardest part of the exercise. It may take some time, so don’t be discouraged if you don’t see the missing part of the puzzle immediately. Persistence is a key trait of all successful people. Once you know what you want do, throw yourself fully into it (that’s what being passionate is all about, isn’t it?) without being naive. Too many well-intended businesses fail because they are not well thought through. A feasibility study and a business plan will help the money to follow your passion and eventually catch up with it. Enjoy the journey and I look forward to hearing your success story. Share your comments, your own experience, and valuable advice for others below!